Eat AND Eat AND Eat: Any visit to London isn't complete without a visit to this foodie heaven. Come hungry! The 1850s location adjacent to London Bridge station is just the latest home for this 1000+ year old food market. Some destinations are iconic for their foodie reputation, others for their historical significance, but few locations can boast a must-visit destination for foodies that is part of a 1000+ year old tradition! Such is the London Borough Market. Located just steps away from the South Bank foot of London Bridge, there has been a food and vegetable market in this area for over 1,000 years. Located in its current home on Southwark Street since the 1850's, in the 1990's gourmet hot food vendors were added to the array of fruit, vegetable, meat, and cheese vendors to transform the area into much more than a farmer's market. Open from Monday to Saturday (with peak vendor participation from Wednesday to Saturday), a trip to London is not complete unless you fill pocket with pound coins, empty your stomach, and come on out! With vendors rotating in and out of the market over time and due to the sheer number of choices, there is no point trying to offer a comprehensive review, but know that there will be selections from across continents, vegetarian and vegan options, fresh baked, fried, spiced, hot, cold....you get the picture! On my most recent visit, I sampled the Balkan version of a samosa/empanada, a pork scotch egg, a mediterranen lamb wrap, and a curry chicken pie. I didn't even have space in my belly for the homemade sausages, paella, and local artisan grilled cheese sandwich on offer. I did however, pause for a session of British wine tasting (yes British wine - they make some lovely white wines in the south of England) and a dozen fresh wild, not farmed, Essex oysters that were incredibly plump, chewy, and briny. 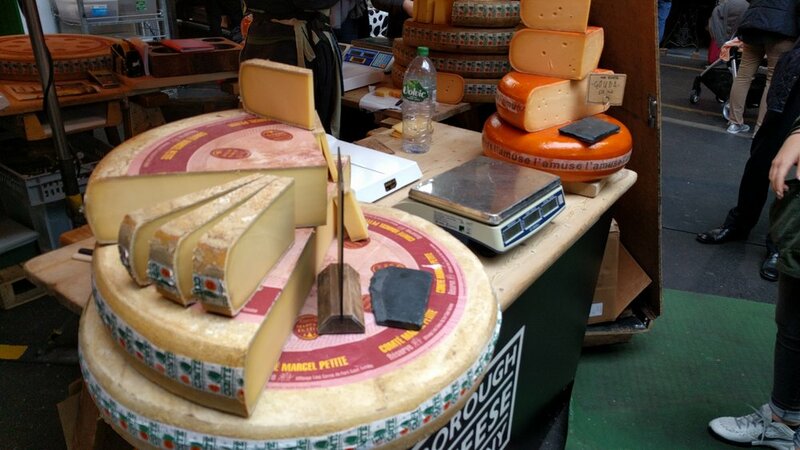 A visit to the Borough Market is best not timed to the exact lunch hour. Since it is a short walk to the financial center of London, it can get quite crowded at noon. Portions of the market are covered to protect you on a rainy day and if you look up, you stand in the shadow of the tallest building in Europe - the Shard. The market is a culinary adventure that perfectly represents the spirit of European market tradition and is a wonderful change of pace from the sit down restaurant experience.